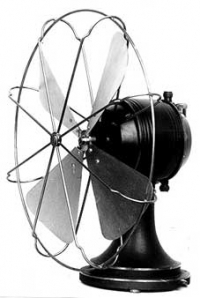 This table fan, designed by Peter Behrens, was introduced in 1908 by Allgemeine Elektricitäts Gesellschaft (A.E.G. ), the successor to DEG (Deutsche Edison Gesellschaft), a German company originally founded 1883 by Emil Rathenau based on Edison's light bulb. AEG was the German equivalent of General Electric in the US. Peter Behrens was appointed artistic advisor to AEG in 1907 and become intensely involved with its architectural, product, and graphic design programs at AEG until World War I. He simply and clearly stated his design philosophy: "It is agreed; we refuse to duplicate handmade works, historical style forms, and other materials for production." In effect, he was the first corporate designer, and created the first "corporate image" for AEG. This included several company trademarks, the last of which, designed in 1914, is still recognizable today. Other AEG designs included a number of electric water kettles and a Turbine Factory Hall in 1909. The factory inspires the US's Albert Kahn in his factories for Ford (1910) and Walter Gropius' Faguswerk shoe factory in Germany (1911), thus establishing the glass and "factory esthetic" at the Deutsche Werkbund exhibition of 1914, which was incorporated into the modern movement. Peter Behrens (1868-1940), a German architect and designer, was born in Hamburg and studied painting at Karlsruhe and Düsseldorf schools of art from 1886 to 1889. He co-founded the Munich Vereinigte Werkstätten für Kunst im Handwerk (United Workshops for Art in Handcraft) in 1897, and was professor of an artists colony in Darmstadt from 1900-1903. He was director of the Düsseldorf School of Arts and Crafts from 1903 to 1907 and was a founding member of the Deutsche Werkbund, also in 1907. Walter Gropius, Le Corbusier and Mies van der Rohe all studied under him.in his office, which he opened in 1908. During and after WW I he continued to practice as an architect. In 1922 he was appointed to the Vienna Academy of Graphic Arts, and in 1936 to a Master's architecture program at the Preussische Academy of Art in Berlin. In 1939, he designed a new administration building for AEG in Berlin.